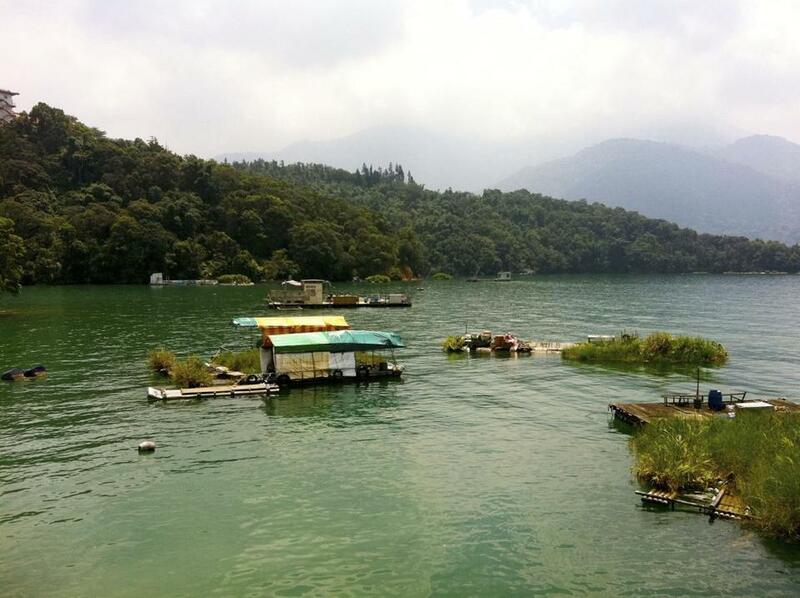 Sun Moon Lake, the largest body of water on the island of Taiwan, supports a fishing culture. 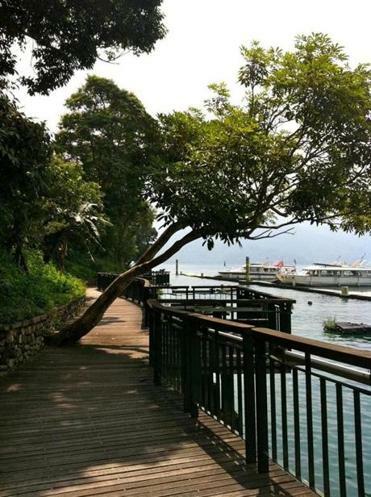 The walking path that surrounds Sun Moon Lake's 33-kilometer circuit. The largest body of water in Taiwan, Sun Moon Lake sneaks up on you as you wind your way along entry roads. Morning sunrises are hazy. The dew is palpable, a heavy mist over the many floating fields of vegetation that were planted long ago by aborigines and brim with small purple buds, sky-reaching orchids, and various vegetables. Frogs cling to the bark of betel nut trees and butterflies flutter on a breeze that alternates with the aromas of pure lake air, grass, and flowers. The bounty of nature is one of the reasons visitors flock to Sun Moon Lake. With 14 hiking trails detouring off a 33-kilometer circuit, the region is a must for outdoor enthusiasts. Some hikes rise to great heights; others pass by historic monuments. Morning runs along the pathway around the lake were the highlight of my day. Families trying to position children for photographs, passing bikers, solitary fishermen, and couples having picnics waved as I passed. It was easy to envelop myself in the spirituality that permeates Taiwanese culture. Fittingly, on one of these runs I stumbled upon Wen Wu Temple. The striking shrine can be reached by the Wen Wu Hiking Trail, a short ¼-kilometer ascension of 366 steps that represent the days of a leap year and are surrounded by bells that ring to commemorate blessings. The temple itself, watched over by two menacing red lions, is consecrated to Confucius and contains the only Confucius statue in Taiwan. Tourists populate the courtyard, as well as earnest students who come to ask Confucius to enlighten them. The Mount Maolan Hiking Trail, a 3-kilometer path that tops off at just over 1,000 meters, brings you past another oft-visited place of worship: The Matchmaker Temple where the county government holds group marriages every year. As I passed, single men and women entered the small grounds to pray for their perfect mate. Mount Maloan’s path traverses the larger Assam tea-producing grounds that surround the lake. The Japanese brought the plants from India during their occupation of Taiwan in the early 1900s. Now towering trees and low-lying tea plants line the electric green hills. If the cultivation of tea intrigues you, a trip to Hugo Assam Tea Farm a short drive from the lake should be on your to-do list. Here you can learn how tea is made, as well as taste emerald, Assam, jade, and ruby varieties. Those who prefer sailing to hiking can join boat tours that leave from Shuishe Pier and last a couple of hours; more independent types can rent rowboats and captain their own excursions. The highlight of any trip is Lalu Island whose name comes from a traditional Thao word meaning “after,” and is a nod to the aborigines, a group numbering about 600 that still lives in and influences the community. Legend has it that Thao hunters chased a white deer for days before it led them to the lake’s emerald waters. Upon discovery, they moved their tribe here. Tourists in Ita Thao Cultural Village shop for food and handicrafts. To understand the history of the area and its aboriginal roots, you can book passage on the Sun Moon Lake Ropeway, an environmentally friendly gondola ride above the lake that connects to Sun Moon Lake Activity Center. Here, the Formosan Aboriginal Culture Village — a kitschy theme park that celebrates the cultures of indigenous people with dance, song, and rituals — offers two to three shows per day at the Naruwan Theater. Another way to experience the Thao flavor of the area is to spend a day exploring the Ita Thao Village on the southeast side of the lake. 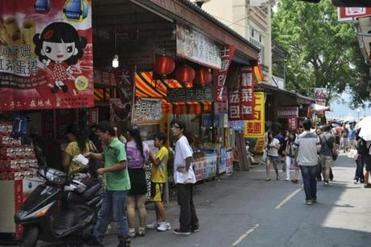 Here streets overflow with vendors selling local handicrafts and food stalls showcasing delicacies like herbal tea eggs, wild boar sausage, pork with sesame seeds, and fried shrimp lettuce wraps. Take your to-go snacks and settle down on Ita Thao Pier for beautiful lake views and terrific people-watching. At the end of the day, check into the Fleur de Chine Hotel on the northern tip of the lake. Preserving the Japanese stamp left on Taiwan before World War II, this is a minimalist luxury establishment that functions like a modern ryokan, even providing traditional loungewear (blue for men, red for women) and slippers for use throughout the common spaces. The floor-to-ceiling glass windows enhance the lake views, and all rooms feature natural hot spring bathtubs.